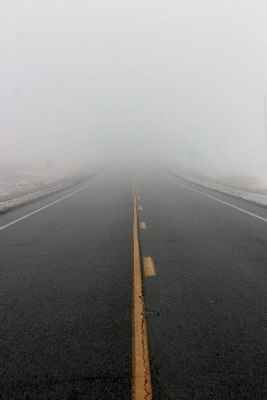 Picture taken before the perimeter was established; Camera found approximately 5 meters within the fog. Camera was damp to the touch, but was completely dry outside of the fog. Camera currently under investigation. Object is to be kept in Area-112 to prevent it from contaminating any further areas. The area itself is a 31 meter by 42 meter town consisting of roughly 16 houses. The town that it rests upon is to be kept clear of people not currently under the effect of the fog. Personnel on duty are to be wearing either a set of headphones playing loud music or sounds, or ear buds that block all sound. Any personnel that falls unconscious while on duty due to not adhering to the previous requirements are to be carried away and put into the guard station, upon which time a new guard will take their place. SCP-XXXX is a thirty (30) meter by thirty (30) meter highly mobile fog. Although relatively harmless, there is a melody- seemingly hummed- within the fog and within five (5) meters of it. Outside of the fog, it is described as a very soothing lullaby (see interview). Inside the fog, the sound causes one to pass out so long as they are within the vicinity of the fog. Upon being carried out, the said person enters a restful state, sleeping for up to 24 hours. Upon awakening, they forget anything that had to do with the fog, up to entering the fog. It is to be noted that those under the age of 10 appear to be immune to this sleep inducing effect. We have sent in multiple test subjects of various ages, and the only ones to come back under their own power were those aged between six to ten. In a vicinity of ten (10) meters, electronics may malfunction. Within the fog itself, electronics batteries are drained. This has hindered our ability to see into this everlasting fog and ascertain its origin. Upon viewing a strange shadow moving within the fog, Agent Baur entered the enclosure to investigate. Little is known about what happened, as Agent Baur never returned, but it is assumed he is dead. Foreword: The sound of the fog. Dr. Bennett: Hello, Agent Katina. You are here to…? Katina: You know damn well why I am here. Dr. Bennett: Ah, yes. The fog? Dr. Bennett: And what do you intend to tell us? Katina: You asked me what the sound of the fog was. I’m here to answer. Dr. Bennett: Yes. Now, get on with it. Katina: Alright. So, the outside of the fog, it sounds like a child’s rhyme being sung. You know, ‘Hush little baby, don’t say a word.’ A lullaby. Dr. Bennett: Is that all you intend to say? Dr. Bennett: You mean the one who entered the fog? Katina: Yes. He said it sounded like his aunt singing him to sleep. Dr. Bennett: So, it sounds different for each listener? Dr. Bennett: Does that mean I can go there and here the song my mother sung for me? Katina: Not necessarily your mother. Any parent you felt close to. Dr. Bennett: Is that all, Agent Katina?